How Much Protein Should You Eat on Atkins? Why Low Fat Diets Don’t Work – What Does Work? Can You Prevent Loose Skin During Weight Loss? High Protein Low Carb Snacks – Will Snacking Sabotage Your Weight Loss? Veggie Bullet Recipes – Zucchini Bolognese – Pasta Without The Carbs! Low Carb Breakfasts – Are You Getting Bored? Veggie Bullet Review – Can it Turn You and Your Kids Into Vegetable Lovers? Power Pressure Cooker XL 10 Quart Review – For Big Families and Holiday Cooking! How to Think Positive About Yourself – 3 Fail Proof Techniques to Kick Self Doubt To the Curb! Ending Codependent Relationships – Does Codependency Lead to Binge Eating? I got this awesome low carb snack from another Pinterester from her Our Paleo Life. 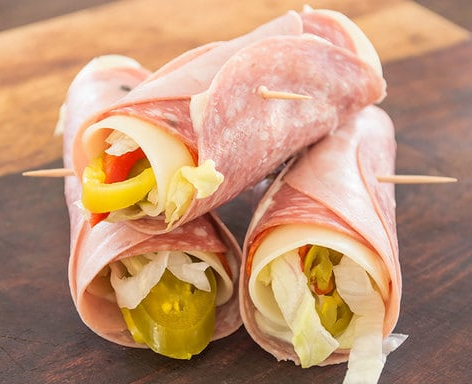 This snack is great for lunch for the kids (or you) or a snack in between meals. . Spread a thin layer of mayo on the stack, making sure to leave space at the top of the largest piece to keep it from squishing out when you roll them up. Add a slice of provolone on top of the mayo, about halfway from the top. Add a small handful of lettuce to the lower half and top with desired toppings (optional). Have the toothpicks nearby and ready to grab. Starting from the bottom of the cheese, gently (but as tightly as possiblroll the stack, pushing in any fillings that find their way out. When you get to the end, secure the outer meat edges with a toothpick. To serve, pour 2 parts oil and 1 part vinegar into a small dipping ramekin. Sprinkle some Italian seasoning on top. Dip the roll-ups in the oil/vinegar and enjoy! How to Store: Wrap them individually in plastic wrap for up to a week. Did you enjoy this snack? Was it easy to prepare? Please leave your comments below. What’s a Dieter’s Favorite Day of the Week to Start? Shalisha Alston on Veggie Bullet Review – Can it Turn You and Your Kids Into Vegetable Lovers? E.S. on Veggie Bullet Review – Can it Turn You and Your Kids Into Vegetable Lovers? © Copyright shalishaalston. All rights reserved.